Integrity - Integrity, integrity, integrity to Integrity. Time… is a living energy, which is one of a powerful gear, moving our inner space - either aligning or misaligning with our Consciousness. Our inner space is like a mirror. It is fixed on a gear. That gear is connected to time. Time is a power - energy. It is one of the dimension of the Cosmos. If you are integrated to time, your inner space aligns to reflect the Consciousness in all its purity. See, a mirror can completely distort Sun or it can mirror straight. When it mirrors straight, it shines literally as Sun. It is equivalent to Sun. Same way when your inner space mirrors Super Consciousness purely, it is equivalent to Super Consciousness. If that gear is in tune with the Time, it aligns your inner space to Cosmic Consciousness. 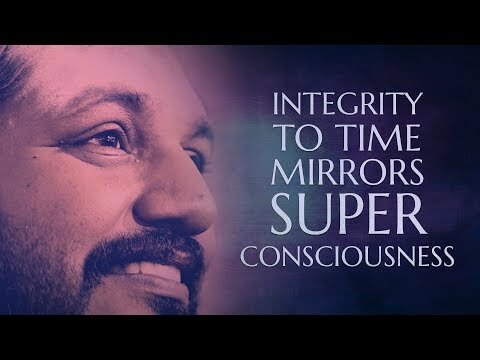 If that mirror is not in tune with the Time, it misaligns or dis-aligns your Cosmic Consciousness. Coming to 4:31 for yoga and doing yoga, can bring you health - not enlightenment. Sharp 4:29 you are there and 4:30 you start yoga, will bring you health and enlightenment. Integrity to Time is important ingredient. If you start the session 1 minute late, it is no more Nithyananda Yoga. It is no more Nithyananda Yoga. All of you be very clear, whether it is pujas in our Sangha or anything - integrity to Time is fundamental requirement for that process to become successful. It may be Homa, it may be yoga, it may be puja, it may be session, it may be class, it may be satsang - early morning 4 to 9 - that 5 hours, that makes you new Being, that makes you spiritually awakened, that makes you Super Conscious Being, that makes you Sadāshiva, that gives you Superconscious breakthrough.